In recent years, highway fatalities and serious injuries have declined considerably - from 41,259 in 2007 to 32,885 in 2010. All of us in the safety community have worked long and hard to help reach this point and a key contributing factor is the data-driven analysis that supports and enables the targeting of safety improvements and effective countermeasures were they are most needed. In 2008, FHWA issued a document that highlighted nine safety countermeasures that could work in concert with a data-driven approach to reduce fatalities and serious injuries. Those countermeasures were chosen based on their proven effectiveness in reducing fatalities and serious injuries. We tracked the implementation of those countermeasures and, due in large part to our collective efforts, many of them are now in widespread use. We also routinely monitor the development of new countermeasures and given the successful and widespread implementation of many of the nine countermeasures, felt it was time to revise the countermeasures list. On January 12, 2012, FHWA issued a revised list of proven safety countermeasures based on the most recent research addressing intersection, roadway departure, and pedestrian issues. A new Web site serves as a reliable and up-to-date resource for information on these countermeasures: http://safety.fhwa.dot.gov/provencountermeasures/. This issue of the Safety Compass is devoted to these nine proven safety countermeasures. As you did so successfully with the 2008 guidance, we encourage you to advance these safety counter-measure options with your State DOT and local counterparts. Highway safety programs that use a data-driven approach to safety improvements with countermeasure selection based on analytical techniques are proving to be quite effective. Our partners should continue to strengthen their evidence-based decision-making processes, as highlighted in the Highway Safety Manual, and systemic planning approaches to make improved safety investment decisions. We will continue to research, identify, and advance proven safety countermeasures and provide those countermeasures to you and our partners so they can be integrated into the decision-making processes that have contributed so effectively to achieving our mutual goal of saving lives and preventing serious injuries. Improving road safety is a top priority for the U.S. Department of Transportation, and FHWA remains committed to reducing highway fatalities and serious injuries on our Nation's highways. We have absolute confidence that certain processes, infra-structure design techniques, and highway features are effective, and we encourage and support their use. To this end, Associate Administrator for Safety Tony Furst issued an updated guidance memo-randum on January 12, 2012, announcing the latest FHWA-recommended set of research-proven safety countermeasures and FHWA advice on countermeasure considerations. In conjunction with this memo, the FHWA Office of Safety launched a new Proven Safety Countermeasures Web site. This Web site serves as a one-stop shop for information on each of the proven countermeasures. Many of these countermeasures are low-cost solutions, and FHWA encourages its partners to consider implementing these countermeasures broadly, as appropriate, to reap the full benefits of using solutions that are known to save lives. The revised set of proven countermeasures, described briefly below but in greater detail at the Web site, was developed based on recent safety research to address intersection, roadway depar-ture, and pedestrian issues wherever they may occur. Data show that roundabouts can reduce injury and fatality crashes by up to 82 percent. About one-third of all intersection fatalities occur at signalized intersections, resulting in roughly 2,300 people killed each year. Furthermore, about 700 people are killed annually in red-light running collisions. Although traffic signals can work well for many intersections, roundabouts have demon-strated substantial safety and operational benefits compared to most other intersection forms and controls, with especially significant reductions in fatal and injury crashes. For example, data show that by converting from a two-way stop control mechanism to a roundabout, a location can experience an 82 percent reduction in severe (injury/fatal) crashes and a 44 percent reduction in overall crashes. Further, by converting from a signalized intersection to a roundabout, a location can experience a 78 percent reduction in severe (injury/fatal) crashes and a 48 percent reduction in overall crashes. Roundabouts are characterized by a geometry that results in a low-speed environment, creating sub-stantial safety advantages. Because entering traffic yields to vehicles in the circulatory roadway, the design provides excellent operational performance. Channelization at the entrance and deflection a-round a center island have proven highly effective in reducing conflict. Roundabouts should be considered as an alternative for intersections on federally funded highway projects that involve new construction or reconstruction, when rehabilitating existing inter-sections that have been identified as needing major safety or operational improvements, and for installation at freeway interchange ramp terminals and at rural high-speed intersections. Areas with raised medians or pedestrian refuge areas at marked crosswalks have demonstrated a 46 percent reduction in pedestrian crashes. More than 80 percent of pedestrians die when hit by vehicles traveling at 40 mph or faster while less than 10 percent die when hit at 20 mph or less. In areas where pedestrians access a transit stop or other clear origins/ destinations across from each other, medians provide a particularly important pedestrian safety countermeasure. Areas with raised medians or pedestrian refuge areas at marked crosswalks have demonstrated a 46 per-cent reduction in pedestrian crashes. At unmarked crosswalk locations, medians have demonstrated a 39 percent reduction in pedestrian crashes. There are several types of medians and pedestrian crossing islands that, if designed and applied appropriately, provide a number of safety benefits, including decreased motorist delay (by greater than 30 percent), a safe place for pedestrians to stop at the mid-point of the roadway before crossing the remaining distance, enhanced visibility of pedestrian crossings, reduced speeds for vehicles approaching pedestrian crossings, enhanced access management, and space for supplemental signage on multi-lane roadways. Raised medians (or refuge areas) should be considered in curbed sections of multi-lane roadways in urban and suburban areas, particularly in areas where there are mixtures of significant pedestrian and vehicle traffic (more than 12,000 Average Daily Traffic (ADT)) and intermediate or high travel speeds. Based on rigorous, statis-tically based crash modi-fication factors, center line rumble strips on rural two-lane roads can produce a 44 percent reduction of head-on crashes producing injuries and fatalities. In 2009, 8,780 single vehicle roadway departure fatalities occurred on two-lane roads. The use of rumble strips can have a positive impact on the number of driver error crashes caused by distracted, drowsy, or otherwise inattentive drivers who unintentionally drift from their lane. Since an inattentive driver is just as likely to leave the road in one location as another miles away, rumble strips are most effective when deployed in a systemic application. NCHRP 641: Guidance for Design and Application of Shoulder and Centerline Rumble Strips, docu-mented that, based on rigorous, statistically based crash modification factors, center line rumble strips on rural two-lane roads can produce a 44 percent reduction of head-on crashes producing injuries and fatalities, while center line rumble strips on urban two-lane roads can result in a 64 percent reduction of head-on crashes that produce injuries and fatalities. Shoulder or edge line rumble strips on rural two-lane roads can bring about a 36 percent reduction of run-off-road fatal and injury crashes. 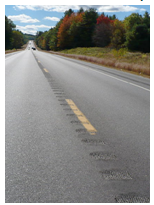 Continuous milled center line rumble strips are appropriate for application system-wide on undivi-ded rural roads with posted speeds of 50 mph or greater. For new or reconstruction projects, 4 feet of pavement should extend beyond the rumble strip. This countermeasure is also suitable for use along rural and urban two-lane road corridors where significant numbers of opposing direction crashes involving any form of motorist inattention have been identified. Continuous milled edge line or shoulder rumble strips are appropriate for application system-wide on rural highways with posted or statutory speeds of 50 mph or greater. They also provide a positive impact along rural or urban corridors where significant numbers of run-off-road crashes that involve any form of motorist inattention have been identified and along any highway with a history of run-off-road crashes. The classic roadway reconfiguration commonly referred to as a "road diet," involves converting an undivided four lane roadway into three lanes made up of two through lanes and a center two-way left-turn lane. By reducing the number of travel lanes, the additional roadway space can be reallocated, a-llowing the installation of bike lanes, pedestrian crossing islands, and/or on-street parking. Road diets offer multiple safety and operational benefits for both vehicles and pedestrians, including fewer travel lanes for pedestrians to cross, room for a pedestrian crossing island, installation of bike lanes to increase bicycle safety, on-street parking (which also serves as a buffer between pedestrians and vehicles), reduced rear-end and side-swipe crashes, improved speed limit compliance, and decreased crash severity. When modified from four travel lanes to two travel lanes with a two-way left-turn lane, roadways have experienced a 29 percent reduction in all roadway crashes. The benefits to pedestrians include reduced crossing distance and fewer midblock crossing locations, which account for more than 70 percent of pedestrian fatalities. 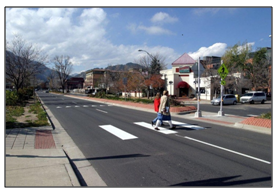 Road diets can be low cost if planned in conjunction with reconstruction or simple overlay projects, since a road diet mostly consists of re-striping. Roadways with Average Daily Traffic (ADT) of 20,000 or less may be good candidates for a road diet and should be evaluated for feasibility. It has been shown that roads with 15,000 ADT or less had very good results in the areas of safety, operations, and livability. roadways have experienced a 29 percent reduction in all roadway crashes. Access management is the practice of controlling access to highways, major arterials, roadways, and points of entry and exit along a roadway. This includes both intersections with other roads and driveways that serve adjacent properties. These entry and exit points can be managed through careful planning that includes consideration of the location of driveways in the context of current and future access and intersection operation needs and mobility for pedestrians and bicyclists. The benefits of access management include improved movement of traffic, reduced crashes, and fewer vehicle conflicts. Access management principles may be applied to all types of roadways, ranging from fully access-controlled facilities, such as freeways, to those with little or no access control, such as local streets. By changing access density, access management techniques have proven to enhance safety, preserve capacity, and provide for pedestrian and bicycle needs. Common access management treatments range from driveway closure, consolidation, or relocation to restricted-movement designs for driveways (such as right-in/right-out only) and alternative designs for intersections (such as J-turns, median U-turns and quadrant roadways). Other methods include raised medians that prevent cross-roadway movements and focus turns and/or U-turns to key intersections, adding auxiliary turn lanes (including exclusive left or right and two-way left), constructing parallel, lower speed one-way or two-way frontage roads for access, and using roundabouts or mini-roundabouts to provided needed or desired access. 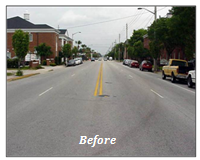 The benefit-cost ratio of using Safety EdgeSM on two-lane roads is very high, ranging from 4 to 63. Vertical pavement edges are recognized as a contributing factor to severe crashes that often involve rollovers or head-on collisions. Studies in some States find that crashes involving edge drop-offs are two to four times more likely to include a fatality than other crashes on similar roads. Providing a flush, unpaved surface adjacent to the pavement resolves the issue temporarily, but the material is often displaced over time, recreating the dangerous drop-offs either continuously or intermittently along the pavement edge. The Safety EdgeSM is one of the innovative technologies being deployed as part of FHWA's Every Day Counts initiative. The Safety EdgeSM is a proven paving technique that creates a durable 30 degree angle at the edge of a paved way, creating a gentle slope that facilitates vehicle re-entry. The Safety EdgeSM, which has been successfully con-structed on both asphalt and concrete pavements, functions by eliminating tire scrubbing, a phenom-enon that contributes to losing control of a vehicle. An evaluation conducted by FHWA indicates that application of the Safety EdgeSM has led to an estimated reduction of 6 percent in total crashes on two-lane highways. Because of the low cost of the Safety EdgeSM, the benefit-cost ratio on two-lane roads is very high, ranging from 4 to 63. 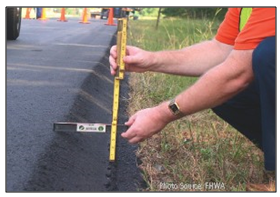 The FHWA encourages State and local agencies to develop standards for implementing the Safety EdgeSM for all asphalt paving projects without curbs as well as for concrete pavement projects. Locations where pedestrian hybrid beacons have been installed have experienced up to a 69 percent reduction in pedestrian crashes and up to a 29 percent reduction in total roadway crashes. More than 70 percent of pedestrian fatalities occur at midblock locations, where vehicle travel speeds are usually higher, contributing to higher injury and fatality rates at these locations. The pedestrian hybrid beacon (also known as the High intensity Activated crossWalK (or HAWK)) is a pedestrian-activated warning device located on the roadside or on mast arms over midblock pedestrian crossings designed to reduce pedestrian injuries and fatalities by providing a visual cue to warn approaching vehicles that pedestrians are present. As shown in the photo, the beacon head consists of two red lenses above a single yellow lens. The beacon head is "dark" until the pedestrian desires to cross the street. At this point, the pedestrian will push an easy to reach button that activates the beacon. After displaying brief flashing and steady yellow intervals, the device displays a steady red indication to drivers and a "WALK" indication to pedestrians, allowing them to cross a major roadway while traffic is stopped. After the pedestrian phase ends, the "WALK" indication changes to a flashing orange hand to notify pedestrians that their clearance time is ending. The hybrid beacon displays alternating flashing red lights to drivers while pedestrians finish their crossings before once again going dark at the conclusion of the cycle. Pedestrian hybrid beacons should only be used in conjunction with a marked crosswalk. In general, they should be used if gaps in traffic are not adequate to permit pedestrians to cross, if vehicle speeds on the major street are too high to permit pedestrians to cross, or if pedestrian delay is excessive. Transit and school locations may be good places to consider using the pedestrian hybrid beacon. Because this countermeasure is fairly new, public education may be needed for areas where these beacons are used. For more information and guidance on the proper installation of pedestrian hybrid beacons, refer to the Manual on Uniform Traffic Control Devices, Chapter 4F. Backplates provide a controlled-contrast back-ground to a traffic signal head that serves to improve the visibility of the illuminated face of the signal. The improved visibility of a signal head with a backplate is then made more conspicuous by framing the backplate with a retroreflective border. Since their initial introduction in Canada in the late 1990s, several State highway departments and local road agencies in the United States have adopted practices and policies promoting the use of backplates with retroreflective borders. In addition to adding conspicuity in both daytime and nighttime conditions, thereby reducing unintentional red-light running crashes, this treatment also serves as a human factors enhancement that increases traffic signal visibility and conspicuity for older and colorblind drivers. The addition of retroreflective borders around the signal head also provides increased visibility during periods of power outage, when the signals would otherwise be dark. 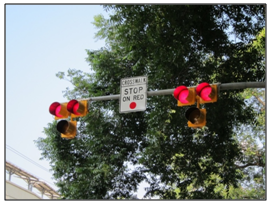 Per the study included in the Crash Modification Factor Clearinghouse, the addition of retroreflective borders to signal heads with backplates may result in a 15 percent reduction in all crashes at urban, signalized intersections. 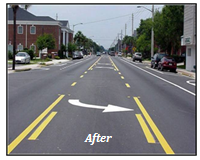 The FHWA encourages agencies to consider the use of backplates with retroreflective borders -which is a very low-cost safety treatment, as the materials are simple strips of retroreflective sheeting - as part of their systemic safety improvement efforts at signalized intersections. The most effective means of implementing this proven safety countermeasure is to adopt it as a standard treatment for signalized intersections across a jurisdiction so that it is consistently included with all new construction and modern-ization projects, as well as being a worthy retrofit project for existing signals at intersections with red-light running crash histories. Installing chevron signs on horizontal curves can produce a 16 percent reduction in non-intersection fatal and injury crashes. Recent data analysis shows that 28 percent of all fatal crashes occur on horizontal curves. Furthermore, about three times as many crashes occur on curves as occur on tangential sections of roadways. Recent research on signing and marking practices has shown great potential for improving safety with low-cost options such as enhanced delineation. There are also a variety of high-friction surface treatments available to improve tire traction. While these treatments typically have a higher unit cost than traditional friction courses, they can often be applied at a specific curve location for a relatively low cost. 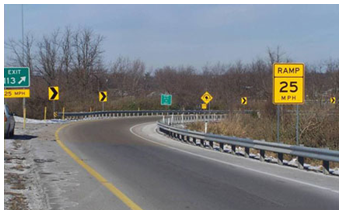 High-friction treatments can be applied either at a single location or as part of a project to improve friction at a number of curves in a corridor or district that are prone to friction-related crashes. Other low-cost treatments with proven safety bene-fits include installing chevron signs, curve warning signs, and/or sequential flashing beacons, which can result in a 38-43 percent reduction in all fatal and injury crashes; installing chevron signs on horizontal curves, which can produce a 16 percent reduction in non-intersection fatal and injury crashes; installing new fluorescent curve signs or upgrading existing curve signs to fluorescent sheeting, which can result in 25 percent reduction in non-intersection fatal and injury crashes; and providing static combination horizontal alignment / advisory speed signs, which can generate a 13 percent reduction in all injury crashes. The FHWA encourages State and local agencies to review signing practices and policies to ensure they comply with the new 2009 MUTCD guidance. Agencies should also work to develop a process for identifying and treating problem curves that takes into account the full range of available treatments described here and uses the appropriate application for the identified problem(s). Over the next year the Office of Safety will focus on technical assistance and guidance to help increase the widespread implementation of the proven countermeasures. In February 2012, the Office of Safety began tracking the implementation of these countermeasures and will work to replace the current countermeasure index that every Division currently updates quarterly. The new performance measure is based on implementation and takes into consideration an analysis of safety data and a State's specific safety needs. More information on this process will be forthcoming before we fully transition to the new measure. Your comments and highway safety-related articles are welcomed. This newsletter is intended to increase highway safety awareness and information and to provide resources to help save lives. You are encouraged to submit highway safety articles that might be of value to the highway safety community. Send your comments, questions and articles for review electronically to Karen Timpone, karen.timpone@dot.gov.